helps to fill the coffers of the criminal military regime. question about this on their wall. 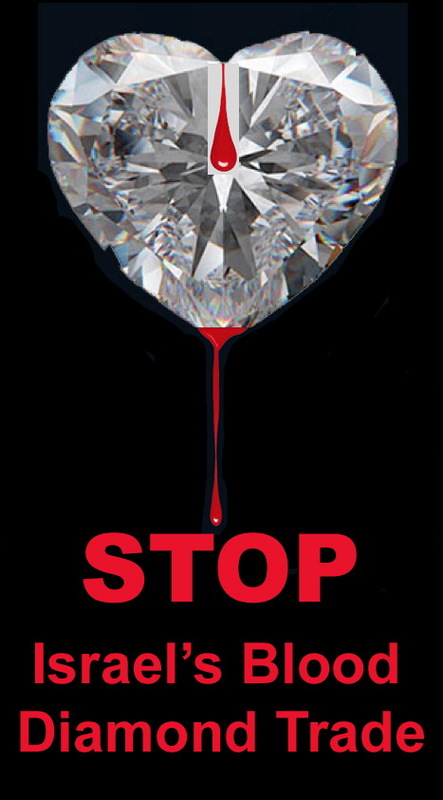 Israel are not Conflict Free – they are Blood diamonds. The WDC created a web site called Diamondfacts.org to promote the virtues of the industry. It lists 24 facts extolling the benefits of the diamond industry — primarily to India and countries in Africa. Some of the benefits include that an estimated 5 million people have access to appropriate healthcare globally thanks to revenues from diamonds; diamond revenues enable every child in Botswana to receive free education up to the age of 13; the revenue from diamonds is instrumental in the fight against the HIV/AIDS pandemic. Blue Nile, an IDA supported, Nasdaq listed company with its European headquarters in Dublin has blocked everyone in Ireland from accessing its Facebook page www.facebook.com/bluenile . Blue Nile is one of the world’s leading online diamond retailers. The company promotes itself as a supplier of “ethically sourced” diamonds and claims to have a zero-tolerance policy towards conflict diamonds. According to the company “All Blue Nile diamonds are warranted to be conflict free”. The company promotes itself on Facebook where it has over 90,000 very active subscribers. Despite all this, for the past four months the company has been resorting to censorship on its Facebook page in an effort to block subscribers who have questioned the provenance of Blue Nile’s so-called conflict free diamonds. Subscribers asked if any of Blue Nile’s diamonds are cut and polished in Israel where the military stands accused of war crimes and other serious human rights violations. According to Israeli economist and author, Shir Hever, revenue from the Israeli diamond industry provides about $1 billion annually in funding for the Israeli military/security industry. Some Blue Nile’s Facebook subscribers asked whether or not they are selling diamonds crafted in Israel as conflict free diamonds and how this can be justified given the facts outlined above. The company deleted all such queries without answering the question and blocked scores of people from viewing their page. However, as more and more people, many of them from Ireland, continued to post questions on their Wall the company blocked everyone with an Irish internet address from accessing their page. Last week more people outside Ireland posted questions on the company’s Facebook page and once again Blue Nile deleted the questions and blocked them, but this time they also blocked all of their 90,000 subscribers from posting new threads or pictures on their wall. This is a very significant move in this a peak sales period in the run up to Valentine’s Day. It demonstrates how sensitive the company is to revealing where its diamonds are cut and polished. The failure of the company to state whether or not is selling diamonds crafted in Israel and the fact that it has employed censorship measures normally only associated with regimes such as the Mubarak dictatorship in Egypt, strongly suggests the company has something to hide. If Blue Nile is selling what are de facto Israeli blood diamonds, future IDA support for the company should be conditional on a guarantee that it no longer sells diamonds crafted in Israel where revenue from the diamond industry is funding the illegal occupation of Palestinian territory and gross human rights violations. The information below shows the importance of the diamond industry to the Israeli economy. Israel is one of the diamond world’s leading centers – a hub for both the trade and manufacture of polished diamonds. Processing a great amount of the world’s gem-quality rough in dollar terms, Israeli diamond companies supply the stones that garnish a vast amount of the diamond jewelry sold worldwide. Israel’s diamond polishing factories – considered the most advanced in the world – are equipped with sophisticated diamond processing technologies – many of which were developed locally. Israeli technological advances such as lasers for diamond cutting, brutting machines, automatic polishing machines and computer aided design systems are used today throughout the global diamond industry. Israel’s experienced diamond polishers rely on a rich tradition of know-how and expert craftsmanship. Their experience is invaluable in polishing larger and more expensive stones. That’s why diamond manufacturing facilities in Israel specialize in polishing large and medium sized diamonds, of all shapes and cuts. In the past decade Israeli diamantaires have used their talent and ingenuity to introduce many new cuts into the market. Israel has also expanded its manufacturing capabilities to various offshore locations – in India, China, Africa and elsewhere. The majority of diamonds processed abroad are smaller stones. They are imported back into Israel for grading and sorting, and are eventually exported by Israeli companies to markets in North America, Asia, Europe and elsewhere. The Israel Diamond Exchange (IDE), one of the largest and most sophisticated diamond centers in the world, was established in 1937 and counts approximately 3,000 members engaged in manufacturing, import and export and marketing of rough and polished diamonds. IDE creates a business framework for its members, enabling both members and visitors to conduct their business in maximum convenience and security, both in the trading hall and within the confines of their private offices. The Israel Diamond Exchange operates under the unique concept of “all under one roof”. It consists of four interconnected high-rise buildings that form a virtually impenetrable fortress. Connected internally by pedestrian bridges, it is protected by an advanced security system. In addition to the largest diamond trading floor in the world, IDE houses more than 1,200 private offices, covering an expanse of approximately 90,000 sq. meters, with about 15,000 people each day passing through the complex. In this setting members and visitors have access to a complete range of services within the complex –from essential business services such as shipping agents, commercial banks, insurance companies, the government diamond controller’s office, customs office, post office, gemological labs – to conveniences such as restaurants, shops, lounge, intensive care room, synagogue and more — and have no need to leave the secured complex. IDE’s huge diamond trading floor consists of two trading halls (for rough and polished stones) spanning an area of approximately 2,500 sq. meters. Hundreds of diamantaires operate daily in the vibrant trading halls together with numerous foreign buyers who come from all corners of the globe to purchase their diamonds in Israel. The IDE trading halls are furnished with state of the art equipment – sophisticated communication systems, computers and internet networks and official diamond weighing services. Also located in the trade halls is an advanced technology area boasting sophisticated equipment for diamond checking, including instruments for analyzing rough diamonds and laser branding, a diamond photocopier, tools for color filtering, microscopes, etc. The Israel Diamond Exchange operates for the benefits of its members. It sets policy with regard to trade rules and conduct befitting its members. One of its central functions is operating a system of arbitration for its members, which is a legal system accepted by Israel’s courts. This institution constitutes an integral and essential part in the commercial life of its members and acts for their benefit. A visit to the Israel Diamond Exchange is like a trip to a huge supermarket. Every type of diamond in every size, shape and quality can be purchased in Israel: small, medium-sized and large stones, rounds and fancy-cuts, special cuts innovated by Israeli and other diamantaires, white diamonds of every grade and natural colored diamonds in every shade. Its ability to guarantee a steady supply of any type of goods makes Israel a most attractive supplier to the jewelry trade. All over the world diamond deals are clinched with a handshake and with the two Hebrew words “mazal u’bracha” (may the deal be with luck & blessings). This is the accepted code among diamond dealers whether in Israel, the U.S., China, India and even Arab countries. Representatives of the leading diamond mining companies as well as the foremost international companies in rough diamond trading are stationed in the IDE complex. In addition, the complex houses leading international companies manufacturing and trading in polished diamonds and jewelry, and offering associated services to the international jewelry trade. For many diamond companies the Israel Diamond Exchange presents a strategic commercial center for their head office, from where they conduct their global operations. The Israel Diamond Exchange holds a prominent and central position in the international industry including key roles in all the branch international organizations – among them the World Federation of Diamond Bourses (uniting bourses from 5 continents), the International Diamond Manufacturers’ Association, the World Diamond Council and the Kimberley Process. Since 2008 Mr. Avi Paz, the President of the Israel Diamond Exchange, has simultaneously held the position of President of the World Federation of Diamond Bourses. Similarly, since 2008, Mr. Moti Ganz, the President of the Israel Diamond Manufacturers’ Association and Chairman of the Israel Diamond Institute Group of Companies has simultaneously held the position of President of the International Diamond Manufacturers’ Association. The IDE has been one of the protagonists in consolidating and implementing the Kimberley Process, an international process for preventing trade in conflict diamonds, under the auspices of the UN, with more than 70 states participating as well as international human rights organizations. Israel presently (2010) holds the Chair of the Kimberley Process. Since the State of Israel was established the Israeli Diamond Industry has contributed significantly to the development of its economy. Polished diamonds are one of Israel’s leading export items. Today Israel is one of the world’s largest exporters of polished diamonds, and a major center for the trade in rough diamonds as well. About one third of global rough diamond production is imported to the Israel Diamond Exchange each year from where it finds its way to world markets. Israel is the foremost polished diamond supplier to the US market, which is considered the largest diamond consumption market in the world. Approximately 50% of diamonds purchased in the US in dollar terms come from Israel. With the rapid growth of Asian markets – most notably Hong Kong, China and India — Israel is rapidly becoming a major factor in supplying these markets as well. The Israeli Diamond Industry contributes approximately $800 million annually to Israel’s balance of payments. More than 20,000 families earn their livelihood directly through the Israeli Diamond Industry. Moreover, approximately 330,000 visitors and foreign buyers visit the complex annually. In addition to the 20,000 employed directly, the Israeli Diamond Industry contributes indirectly to other branches of the economy such as tourism, banking, aviation, communications and security, and is responsible for creating many more employment opportunities. The Israeli Diamond Industry has also been instrumental in the urban and economic development of Ramat-Gan. “Ramat-Gan City” one of the most important and vibrant business centers in Israel was built around the diamond complex. The Israeli Diamond Industry works in close cooperation with the Ramat Gan municipality on a wide range of activities aimed at developing the city and promoting the welfare of its citizens. Similarly, the industry has a long history of cooperation with Shenkar College of Engineering and Design for the advancement of industry, art, design and higher education in the city. The diamond industry has always been entwined with the history of the Jewish people in Europe. In medieval times, legal prohibitions limited Jews to certain professions and this was an a branch free of trade and guild restrictions. Moreover, diamond trade routes corresponded with the links between Jewish centers in the Diaspora and thus the trade was particularly suited to Jewish enterprise. For this and other reasons, the diamond trade became a popular occupation among Jews and many acquired professionalism and extensive knowledge in the field. Israel’s industry began in the 1930s by enterprising immigrants who brought a trade they had learned in Belgium. By 1940 a handful of factories were operating in Netanya and Tel Aviv and in 1937 the “Israel Diamond Exchange” was formed, under the name the “Palestine Diamond Club”. The diamond club met first in a room in a private house and later moved to a cafe in Tel Aviv. During WW2, when the traditional European centers fell under German occupation, Israel became a major source for polished diamonds. With the establishment of the State of Israel in 1948 came a new influx of immigrants who were enlisted to work in the newly established diamond industry. Locally-developed manufacturing techniques made it possible to train workers within months. Over the years the industry continued to grow, as diamond workers established their own manufacturing and trading businesses. Exports grew to the United States, the Far East and Europe. Israel was responsible for introducing most of the technological advances to the industry, including the laser, automatic brutting and polishing, and computerized decision making systems, which today are found in diamond manufacturing factories around the world.